DALLAS, Texas (KTRK) -- Dallas Cowboys quarterback Tony Romo is leaving football and going into broadcasting, league sources tell ESPN. ESPN broke the news this morning on Twitter. "I guess it's time to start dressing up." The Cowboys officially released Romo Tuesday afternoon with ESPN reporting that Cowboys owner Jerry Jones honored his promise to release Romo. "They have relinquished his future NFL rights," Ed Werder tweeted. Romo's decision came down to his health, sources close to the situation told ESPN. Romo will be 37 on April 21, and he believes that family and his health are more significant at this period of his life. According to ESPN, Romo spent several weeks thinking about his decision. Jones told Romo before free agency opened that the team would release him to give him a chance to continue his career with another contender. But Dallas decided at the last minute to try to generate interest in a trade. Romo missed several games over the last two seasons after suffering collarbone and back injuries. He ultimately lost his starting quarterback job to Dak Prescott last August when he suffered a compression fracture in his back. Romo informed Jones of his decision to step away from the game for now, sources said. Romo, who was signed through 2019, had a $14 million base salary and a $24.7 million salary cap hit for the Cowboys this season. The franchise leader with 34,183 yards passing and 248 touchdowns, Romo never parlayed his regular-season success into deep playoff runs the way Hall of Famers and multiple Super Bowl winners Roger Staubach and Troy Aikman did before him. Romo played just one series in his final season with Dallas, and his last pass was a 3-yard touchdown to Terrance Williams in a meaningless regular-season finale at Philadelphia. His last snap in a home regular-season game was the last of three broken collarbones sustained in his career, on Thanksgiving in 2015 against Carolina. 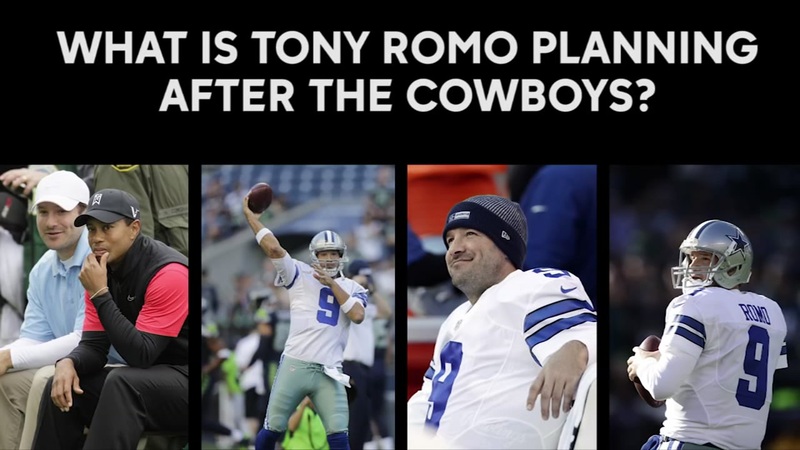 In March, we put together a story about what Romo would do after the Cowboys. What is Tony Romo's plan after the Cowboys? With an expected release or trade from the Dallas Cowboys on the horizon, what will quarterback Tony Romo do?